Note: We can only send informational packets to addresses in Canada, the U.S., and Mexico. For more information on international boardwalk projects, visit our Contact Us page. Designer's Request for a Boardwalk Information Packet! 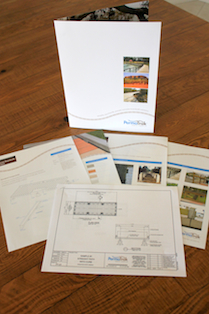 A free concrete boardwalk informational packet to share with clients, colleagues, or file away for future reference. We get it - a concrete boardwalk is an entirely different material to be considered for your next boardwalk project. We've designed this informational brochure to help you become familiar with your options. It's easy, simple, and free to learn more about your options with a concrete boardwalk system. Fill out the form on the right, we will verify your request and send this information packet to you within 48 hours.